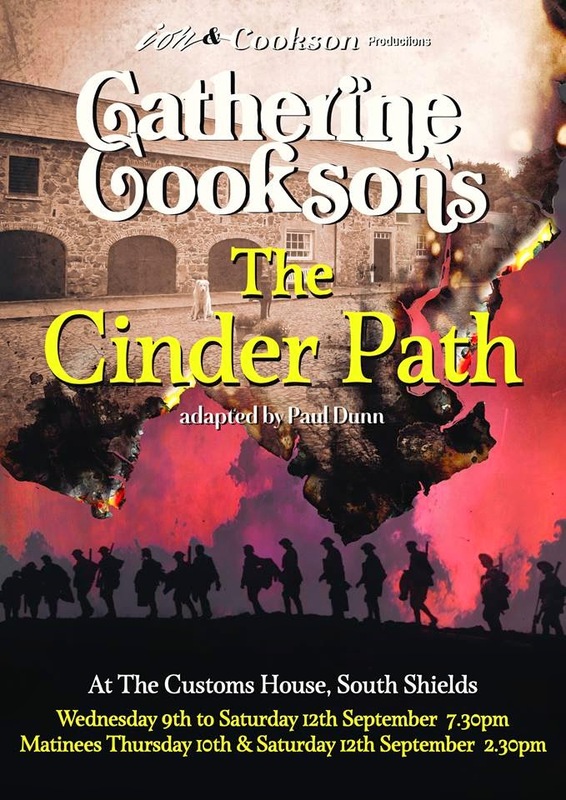 I was invited to a workshop based around the latest draft of South Shields author Catherine Cookson’s The Cinder Path by Gareth Hunter of Ion Productions. Gareth has been producing high quality shows in South Tyneside for 10 years. He had recently brought Cookson’s The Fifteen Streets to South Shield’s Customs House. From the success of that show the stage adaptation of her 1978 book The Cinder Path will be making its world premiere at The Customs House in September 2015. With it being the hundredth anniversary of World War 1, it is fitting that The Cinder Path is the show which has been chosen to be produced this year as it shows how men who had a tough farming background were to head off to war and fight in the trenches. Whilst Cookson is a very popular author, who still regularly features in the charts for the most borrowed author from libraries, she has a reputation for portraying the males in her books in a fairly negative light. The challenge for any stage show will be to retain the strong female characters and make the audience engage with the men. A scan of reviews online for The Cinder Path often refer to a dislike, by the readers of her book, of either the nasty or the weak male characters. This brought us to the very ornate surroundings of the Chapel at the Mission to Seafarers in Mill Dam to see the product of the day’s workshop involving a talented group of actors. Working script in hand and without props they brought the first part of the script alive. The story began with a farmer issuing orders to his staff and castigating the lad from the workhouse who was told to go to the cinder path in order to be punished. Very quickly the father is seen as a very strict disciplinarian as he ignores the pleas of his son to not see the cruel act take place. The strong caring female roles are, likewise, quickly established too. Stories of royal families linking together, through the marriage of offspring, in order to strengthen alliances is mirrored by the desire of the owners of the two neighbouring farms to see their children marry. A funeral and a birthday party later and Cookson’s story looks at relationships within families and by employees. The workshop performances finished with the sacking of an employee who knows a dark secret of his master. It will be interesting in September to return to the full story and find out what happens next. My initial fears about not engaging with the male parts had not come to light. I hope that the son is seen to have some backbone though in the full story. The female roles have the trademark Cookson strength of character. The script and direction had a quick pace. The use of the same actors for multiple roles wasn’t a problem. I’m intrigued to find out how they will bring the key scenes to the stage. The drama has some interesting interplay between its characters and there are some clear challenges ahead to bring the full production to the stage. I have never considered myself to be a fan of wor Kate’s books, I have never had the desire to read one nor have I watched the dramas on TV, and yet I am looking forward to seeing the full finished production of The Cinder Path.